IRS supervisors reportedly ignored employees who warned against possible tax fraud being committed by illegal aliens. Earlier this year. WTHR in Indianapolis did an investigative report exposing a loophole that allows illegal aliens to request Individual Tax Identification Numbers (ITIN) that can then be used to claim the child tax credit on their income tax forms. The IRS currently pays out $6.8 billion in refunds to tax filers using ITINs. A study by the Treasury Department’s Inspector General said that the IRS focused too much on getting refunds out quickly instead of making sure they were sending refunds to qualified taxpayers. Auditors also found that new procedures took away measures that could help tax processors identify fraudulent returns. “[The Treasury Inspector General] found an environment which discourages employees from detecting fraudulent applications,” said J. Russell George, the inspector general. 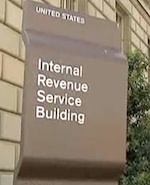 Investigators said the IRS issued 23,994 refunds to one address in Atlanta, totaling $46 million in refunds. And one single bank account was issued 8,393 refunds totaling $236,747, while another account was issued 2,706 refunds totaled $7.3 million in 2011. Multiple bills have been introduced in Congress to close the loophole, including one by Rep. Sam Johnson of Texas. Rep. Johnson has called for the resignation of the IRS Commissioner over the matter. This entry was posted in Anericans Second Class Cirizens n US and tagged 393 refunds totaling $236, 706 refunds totaled $7.3 million in 2011, 747, 994 refunds to one address in Atlanta, And one single bank account was issued 8, criminal illegals scam US IRS, Investigators said the IRS issued 23, Senior IRS Officials Ignored Reports on Illegal-Alien Tax Fraud:, totaling $46 million in refunds, while another account was issued 2. Bookmark the permalink.